The Grumpy Penguin*: "Play Me, I'm Yours"
I was downtown this morning for a group information session put together by The Challenge Factory and spent a little one-on-one time afterwards with my "Career Mentor", Lisa Taylor discussing my next moves. (I'll expand on that in a blog post tomorrow with some exciting news.) After we left the L'espresso Bar Mercurio we walked back toward Avenue Rd. 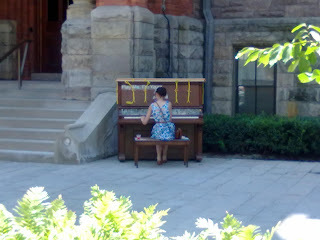 along Bloor St. On our way we came upon a piano, sitting outside in the sunshine, next to the steps of the Royal Conservatory building, with the words "Play Me I'm Yours" displayed prominently on its face. A young lad had just finished playing this piano and had stepped away as we approached, his position on the bench being immediately taken up by the woman you see in this picture. I assumed it had something to do with the Conservatory itself, but when I spoke to Sarah about it later she told me that it was part of a much, much larger art project and that there were pianos all over the city of Toronto. I've always regretted not knowing how to play the piano. I love some of the decorations on the pianos themselves! But you're teaching yourself now! That's pretty impressive. Is Empathy Becoming a Lost Art? The Jays Were Back Today!